Альберт-парк в городе Мельбурн, штат Виктория, принимает Гран-при Ф1 с 1996 года. Ежегодно обустраивается временная трасса вокруг живописного озера к югу от центра Мельбурна. Благодаря хорошей погоде (начали осень в Австралии) и приятному глазу окружению трассы Альберт-парк стал идеальным местом для старта сезона Формулы-1. Достаточно скоростной трек использует существующие дороги вокруг озера, где комбинируются скоростные и медленные повороты, с набором шикан и местом для обгонов в зонах торможения. Максимальная скорость достигает 305 км/ч. Длина трассы: 5 303 метра. Formula1.com рекомендует трибуну Waite (207 евро с четверга по воскресенье) с обзором 12-го поворота, или Brabham Grandstand (345 евро на уик-энд) на выходе из второго поворота, где машины занимают позиции после прохождения первой шиканы. Если планируется небольшой пикник с друзьями или семьей (семейный билет на четверых предлагается за 225 евро), то в зоне свободного размещения на другом берегу озера есть хороший обзор в поворотах 9-10 или 11-12 (113 евро на 4 дня). After the quick flick of turn 2, the cars build up to 300km/h, but this 90° right hander is taken at 90km/h so engine braking on entry is crucial. There also needs to be good engine pick-up on the exit, as this immediately leads into a quick left-right flick: if the driver misses the exit the rhythm is compromised. The fuelling at the exit of the T3 is therefore key and there must be appropriate fuel in the combustion chamber to ensure the engine can produce the power needed. It also needs to be ignited quickly so the quantity has to be completely correct. This double corner is the fastest turn on the circuit, taken at 225km/h with the speed largely carried through. After exiting turn 11 there are two quick downshifts to fifth gear, but the driver will still be very aggressive on the throttle application. This sustained momentum, coupled with the left hand turn generates g-forces of up to 3.5g through turn 11. That sort of g-force pushes everything to the right for a short duration, including fuel and lubricants. The engine still needs to respond to the driver’s demand, despite this heavy load. It needs to produce a lot of torque aggressively, but still has to be precise in its delivery to go through turn 12 and get back up to speed on the run down to turn 13. 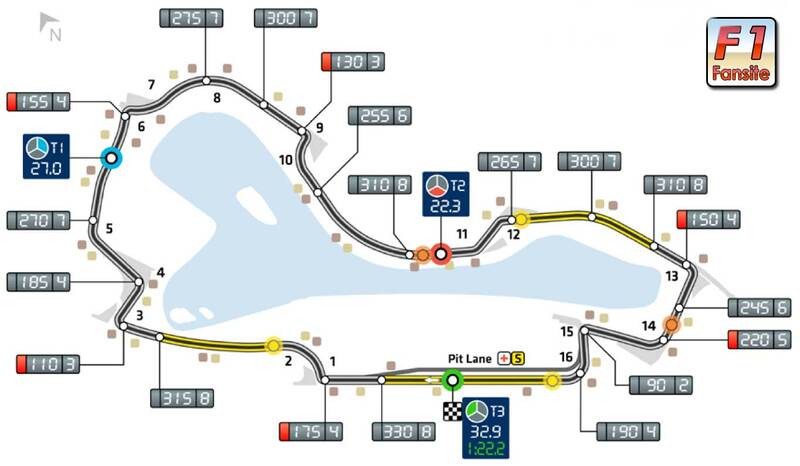 Turns 15 and 16 are linked as an extended chicane but the tendency is to brake too late into 15, which messes up 16. Engineers will work on giving a good balance by delivering the right level of overrun support into 15; ultimately keeping the engine torque stable when the driver is off-throttle and on the brakes. If the overrun support is correct, the rear of the car is stabilised without too much push so the driver does not struggle to turn in. The exit of turn 16 is tricky as the driver is not at full throttle until fourth gear, instead dancing and hovering around in third as he tries to get the power down.